We are in the 7th week of our training program and have made amazing progress in that time. Our hundred-pound American bulldog, Otis, was a little rambunctious and sometimes difficult for my wife to walk. Our trainer, Stephanie, has been great to work with. She genuinely likes our dog and he is always excited to see her. Stephanie always greets my wife and I with a smile and patiently answers all of our questions. She is not just a dog trainer, she is an excellent people teacher! We couldn’t be happier with the results that we’re getting and the interaction with Stephanie. We highly recommend Dogs by Andy, and especially our trainer Stephanie. Prior to sending Miss Princess Eden of Oglukian Road to sleep away camp she would not listen to my commands. I had to stand outside shaking a bag of her treats in order to get her to listen to me and to come inside Also, she would not run beside me, she would run in front of me then turn around and jump on me to play—needless to say I have many pants with shepherd baby teeth holes. Basically, she was in control of the situation(s). I actually contacted Andy after we came home on NYE 2011 and found our home broken into. I knew I wanted a “trained” GSD. I always heard great things about the breed. I wanted to feel safe in my home again home when my husband was not with me. Working for the District Attorney I spoke with many officers and detectives and they all told me the same thing. THE BEST DETERRENT AGAINST A BREAK-IN, IS A DOG. Alarms, lights…those are all secondary. 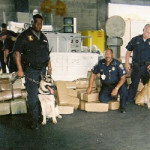 I found Dogs by Andy online after googling GSD’s Charlotte NC. I was considering buying a German Shepherd puppy online and having it sent to our home. Andy was highly opposed to that idea and told me I have to see the puppies, watch how they interact, and see their mother. Andy referred us to Chad as soon as I told him I wanted a GSD. Brageta (sp?) just had a liter that was ready for adoption. Within hours Andy met us a Chads house and within an hour Andy was going with me, Tzvi, and baby Eden to Petco to help us pick out our supplies. Ha-ask Andy how he forgot his dog at work that afternoon and had to leave Chads to go pick him up. He found his dog sitting on his briefcase waiting for him in front of his office. Anyway, 2 months later Eden was back to visit Dogs by Andy for obedience training. Longest 3 weeks of my life!!! I have mentioned Dogs by Andy to numerous people at work. Both Chloe and I had been through another training program but she was still a “wild child,” and I wasn’t really “trained” either! Two of my friends had taken their dogs to Andy, and were very impressed with the results. So was I! I dropped her off right before going on a two-week vacation and picked her up about a week after I came back. The behavioral change was so amazing that I had to ask myself if that was really my Chloe! Amanda was Chloe’s trainer, and she did an incredible job. And it’s great to know that I can bring her back for a refresher lesson should either of us “relapse.” I highly recommended Dogs By Andy (and so does Chloe). Rebecca T.
This is one our dogs, K-9 Vega, who works for the Monroe County Sheriff’s Office in I.A. K-9 Vega was asked to come to the post office to do a package search. 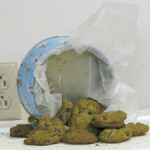 She alerted on a box that contained these cookies witch were baked with Marijuana. The cookies were then delivered to the addressee who was arrested. Interesting fact — the package was sent from her MOM. Askem was called in by US Customs to search containers at a port in Riviera Beach and Mangonia Park, FL. Askem had been sold to the local Police Departments by Andy Hanellin. Officer Klubens currently works with Askem. Askem came up with 3,500 lbs hidden behind a false wall in a container. Askem was bread, trained and sold by Andy of Dogs by Andy K-9 Services.